When Ford took the veil off of the 2011 GT500, it was a veritable goody bag of long-desired improvements to the Blue Ovals supercar. More horsepower, less weight, and a dedicated SVT Performance Package that takes the GT500 and makes it even more of a performance powerhouse. What’s more, they even improved the gas mileage, making the base GT500 $1,000 cheaper by avoiding the gas guzzler tax. Ford revealed this video on Youtube of the new GT500 where we get to hear the sweet symphony of the new aluminum block engine. We envy those Blue Oval test drivers. While hardly the most exciting video, it is enough to whet our appetites for the new GT500. Something about the car just seems trimmer, leaner, and meaner than before. There is also the nifty new electronics onboard that have us realizing the new Ford isn’t just about horsepower, but technology as well. In case you missed the memory, the 2011 GT500 finally has the long-ask-for aluminum block engine. This dropped over 100 pounds off of the front end, while SVT engineers managed to add 10 horsepower to the engine overall. This will improve handling, and also helped the new GT500 to get better gas mileage (for the second year in a row), helping it avoid the dreaded “gas guzzler” tax. Enjoy the almost two minutes of muscle car music, it is two minutes well spent. 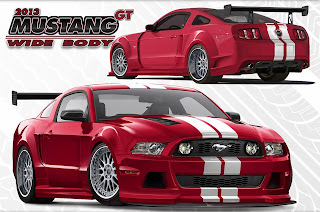 This entry was written by by Chris DeMorro (Stang TV Forums) and posted here on Friday, February 12th, 2010 at 12:03 pm and is filed under Vintage Mustangs. This article was not written by us, rather gathered using RSS feeds listed here. We take no credit for this article. Both comments and pings are currently closed.